Save and restore of old directories when I have upgraded my laptop OS no longer works. Anyway I have switched to the latest release, that appears to be dated on Dec 2017. Right off the bat there was confusion about should I install for Java EE or the standard Java. If I need Java EE later, will it be 2 different installs? Not sure. How do I know what is installed? How do I unhide files in eclipse? 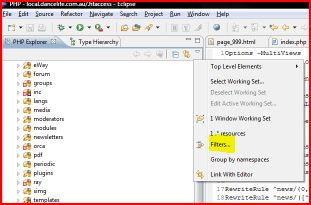 Search for: How do I unhide files in eclipse? Where is the View Menu of a given Project in eclipse? It is on the top right hand side of the Project Explorer sub-window.